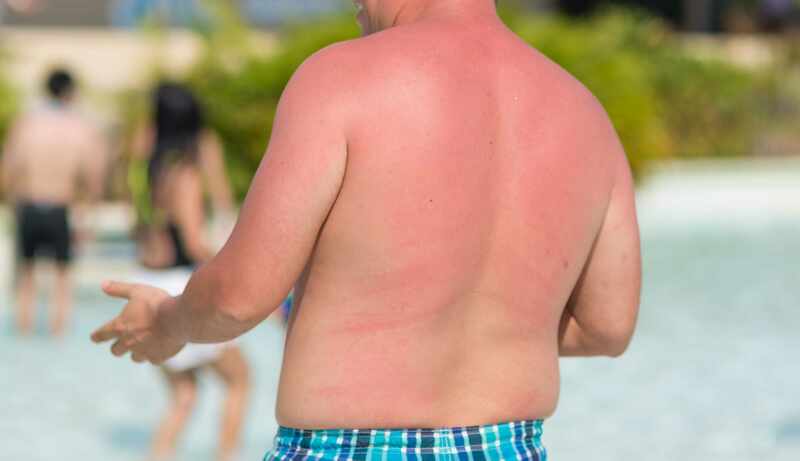 It boils down to what's in the term sunburn: “sun” and “burn.” Simply put, the sun burns your skin. And the result can be pain, redness, blisters and peeling skin. "Prevention is the key," says Dr. Cindy Kermott, a Mayo Clinic preventive medicine physician. "But if you've already been sunburned, taking a cool shower or bath can be a helpful start." Dr. Kermott says the cool water from a shower, bath or cold compress works to tame the inflammation that occurs around a sunburn. Taking an anti-inflammatory medicine can help too. Drinking plenty of water will help replenish what your body is losing in battling the sunburn. Dr. Kermott says to avoid applying topical products to the burned area, as they can irritate the skin and, in some cases, cause an allergic reaction. And don't pop blisters that may form. Watch: Dr. Kermott explains why you shouldn't pop blisters caused by sunburn. Journalists: Broadcast-quality sound bites with Dr. Kermott are in the downloads. "That fluid that’s underneath the blisters is completely sterile," says Dr. Kermott. "It can only become infected if it has exposure to the outside world — if it's popped." Dr. Kermott says if blisters break on their own, apply an antibacterial cream to protect the newly exposed layer of skin. Finally, Dr. Kermott says to wear loose-fitting cotton clothing over the burn to limit any further exposure to the sun until the skin is healed. Cover exposed areas with sunscreen. Seek shade during peak sun hours from 10 a.m. to 4 p.m. Wear a wide-brimmed hat and sunglasses to protect your eyes and the delicate skin around them. If needed, an over-the-counter pain reliever such as ibuprofen (Advil, Motrin IB, others) or naproxen sodium (Aleve) may help control the pain and swelling of sunburn, especially if you take it soon after sun exposure. Some types of pain relievers may be applied to your skin as gels. Apply to the affected skin a compress — such as a towel dampened with cool tap water. Or take a cool bath or shower. An aloe vera lotion or gel may be soothing. If a blister breaks, gently clean the area with mild soap and water, apply an antibiotic ointment, and cover it with a nonstick gauze bandage. Within a few days, the affected area may begin to peel. This is your body's way of getting rid of the top layer of damaged skin. While your skin is peeling, continue to moisturize. Stay out of the sun or protect yourself from sunlight when you go outside. Such creams may irritate the skin or cause an allergic reaction. Benzocaine has been linked to a rare but potentially deadly condition that decreases the amount of oxygen that the blood can carry (methemoglobinemia).